A dense, rounded, dwarf shrub with purple tinged green foliage. Blooms profusely with slightly fragrant two-toned magenta-rose and light purple flowers. It was developed in Canada and has improved cold tolerance. It grows best in full sun in an average, well-drained soil. Prune after flowering if needed. 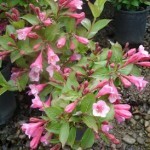 A lovely dwarf shrub for the border, foundation, or mass planting.